For the Apple with Everything . . .
Doggone it, Pixar is GOOD! BOO on Sony! PeTA vs Vick - WHO Kills More Animals? Self Control or Spaced Out? A strain of Ankole cattle. Their horns serve as cooling mechanisms, much like a car's radiator. The blood flowing through the horns cools down slightly before returning to the animal's body. This helps the Ankole and related rare strains of cattle adapt to high levels of heat and require less water to stay cool . . .and to survive. 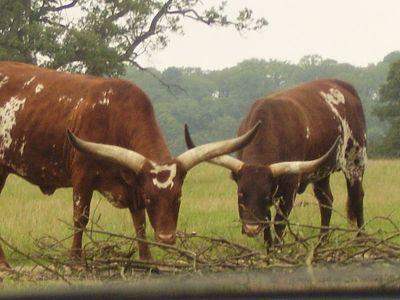 Ankole Cattle generally include several strains (also known as unimproved, primitive land races) that were imported from their African countries of origin to be raised and preserved here in the USA. Rare breed conservatories help to ensure genetic diversity and the survival of primitive strains that have become endangered due to types of animal 'monocropping' around the world with popular modern breeds. See American livestock Breeds Conservancy for more details on some domestic programs and see Google for other examples. "We have no ethical obligation to preserve the different breeds of livestock produced through selective breeding. One generation and out. We have no problem with the extinction of domestic animals. They are creations of human selective breeding." The world’s livestock production has become dangerously over-reliant on just a few high-yielding breeds, causing the loss of many hardier breeds more suited to poor countries, according to a report by the United Nations Food and Agriculture Organisation. In its first survey of the world’s animal genetic resources, the FAO says 20 per cent of the more than 7,600 breeds of farm animals and poultry it has identified are at risk of extinction. Almost one breed has been lost every month over the past six years. Carlos Seré, director general of the International Livestock Research Institute (ILRI), a publicly funded Nairobi-based research network, on Monday called for the rapid establishment of gene banks, especially in Africa, to conserve the sperm and eggs of animals at risk. The FAO report, which surveyed livestock in nearly 170 countries, found that the black-and-white Holstein-Friesian dairy cow is now found in 128 countries around the world, while 90 per cent of cattle in industrialised nations come from only six tightly defined breeds. Developing countries account for nearly 70 per cent of the world’s remaining unique livestock breeds but these are being rapidly supplanted by higher yielding stock imported from Europe and the US. In northern Vietnam, for instance, local breeds comprised nearly three-quarters of the sow population in 1994 but by 2000 this proportion had dropped to only a quarter. Mr Seré says despite the short-term benefits this strategy poses high risks because many of these breeds cannot cope with developing country conditions. The ILRI points to the example of Uganda where, during a recent drought, farmers that had kept their hardy Ankole cattle were able to walk them long distances to water sources, while those who had traded the Ankole for Holstein-Friesians and other imported breeds lost their entire herds. Many developing countries abandon lower production (unimproved) heritage animals in order to attempt to step up production using modern animals that were developed to be used in extremely different production environments. Think of it as backyard breeding, with little consideration for genetic, ecological and environmental reality. Often, native farmers are encouraged or _forced_ by city slicker government officials who ride on ignorant hype (sound familiar?) to change their production values. This has often resulted in problems. Turkish livestock producers crossed their native sheep with Merino and ended up with animals with the wrong type of wool for the environment and poorer ability to survive and forage in rough terrain. The American Indians used Merino crosses on their primitive sheep and it also resulted in similar failures and hardship. Wayne Pacelle has complained on his blog, that his quote at the top of this post has been taken out of context by those of us who are anxious to preserve our freedom of choice in animal issues. He has apparently been trying to do damage control by appealing to pet people and trying to encourage them to believe that his position on animal issues are mainstream. He claims the quote is intended it to be about rare breed livestock. . . . of course, most pet people wouldn't know an Ankole cow from a Scottish Highland steer and probably think he is right due to their own lack of animal background. As you can see, even applied to livestock, the man frankly demonstrates no animal sense. The world of animals and their adaptations and the routines needed to preserve them are are all quite complex.